Search Brand Index: What are US and UK over branded iOS app types? Second subcategory research in the field of mobile search traffic by ASOdesk team. Now it’s time to identify — what percentage of mobile traffic goes for brands, and how many percents of users are searching for app by their genre? This might be helpful research for the developers who knows App Store Optimization but don’t know which product to develop. Here we are telling you which subcategory are most over branded and there is hard to get users if you are unknown. And which subcategory is not branded at all and will get luck and get users. For this research all traffic was divided for 2 kinds — brand traffic and genre traffic. For example, if you search for Tinder — it is brand search traffic, if you type dating, then this is genre search traffic. 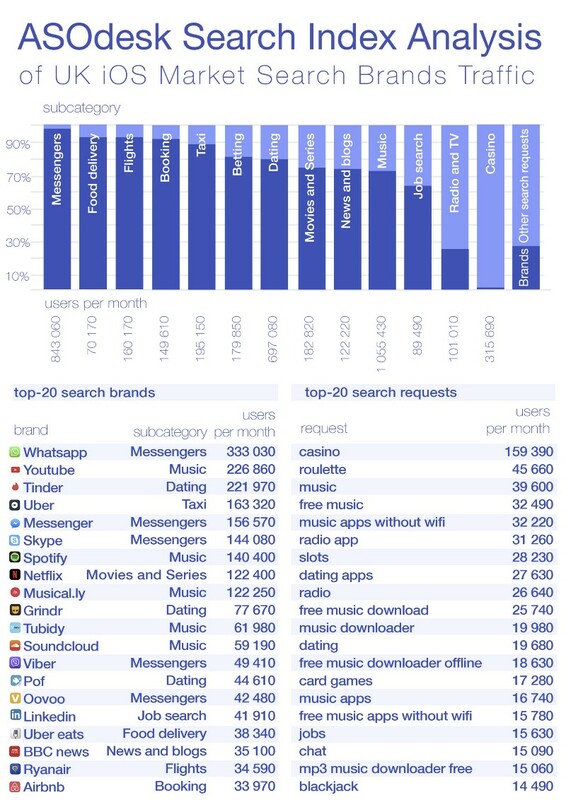 UK’s most branded subcategory is Messengers, as a result — 5 apps in the top-20 of most popular. The most branded category in the US is Taxi, greetings to Uber and Lyft apps. Food delivery category is second most branded subcategory in both countries, and others categories are more or less in the same order. Also, the top apps in US and UK are 90% the same and thats incredible. Interestingly, the top genre search requests and top app names requests do not match the apps by genre. Top subcategories traffic — is music in the US and music and casino in UK. 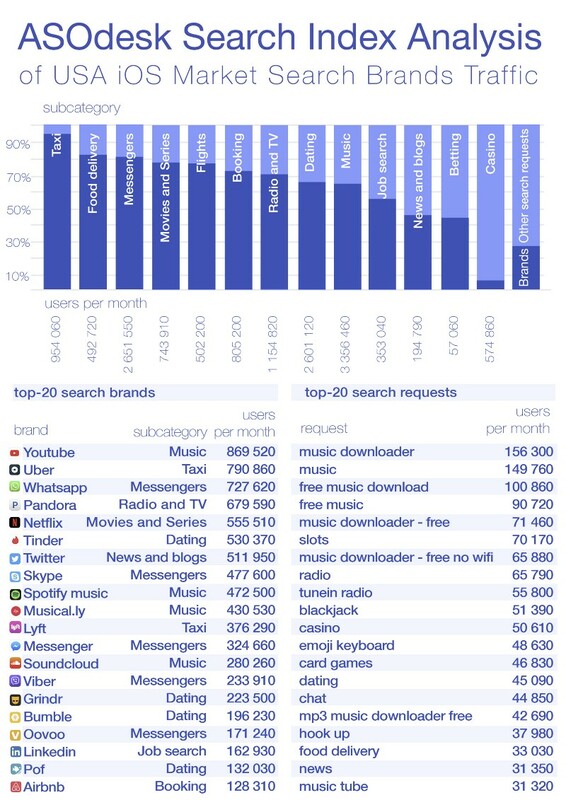 Top apps on the traffic — Youtube — music and Whatsapp — from the genre of messengers. Mobile developers now knows the volumes of genres traffic by subcategory and can restructure their expectations about ASO. If genre traffic dominates (<50%) in subcategory, this may indicate a possible lack of unambiguous leaders in these sub-categories (but in any case, not the absence of competition or the products). Lack of leaders within a niche — it’s always a chance. To determine the list of most popular apps subcategories, ASOdesk specialists used the Top Charts in each country. On the basis of the collected data, they identified 13 most popular subcategories (not to be confused with the subcategories in the App Store): Music, Taxi, Flights, Messengers, Food delivery, Casino, Betting, Dating, Movies and Serials, Radio and TV, Booking, Job search, News and blogs. Furthermore, for each subcategory, the store suggestions were determined — in which users are suggested an app related to a particular subcategory. For the study, we used only App Store search suggestions in the United States and UK, where the index of Users per Day was counted on the ASOdesk.com platform.